Larry Spencer, skipper of the Olson 30 Blue Star, held the perpetual trophy for the PHRF boat with the lowest corrected time in the 42-nautical-mile Milt Ingram Trophy Race. The trophy was donated by Milt’s daughter Blanche and depicts the famous yacht America. VENTURA — Pierpoint Bay Yacht Club hosted what is known as “the largest sailboat race in Ventura County” on July 8-10. The Milt Ingram Trophy Race, or Milt’s Race, is part of Santa Barbara Yacht Club’s Wilson Series and the Ventura Sailing Club’s beach cat series bringing sailors to Ventura from as close as Oxnard and Channel Islands to as far as Arizona. Racing kicked off at 11 a.m. on July 9 with participants racing on the 42-nautical-mile course from the Mandalay buoy to Anacapa Island, finishing in the Ventura Harbor entrance channel. The day ended with a complimentary after-race dinner. On July 10, sailors began their day with a champagne breakfast before heading out on the water. A trophy presentation took place later that night. 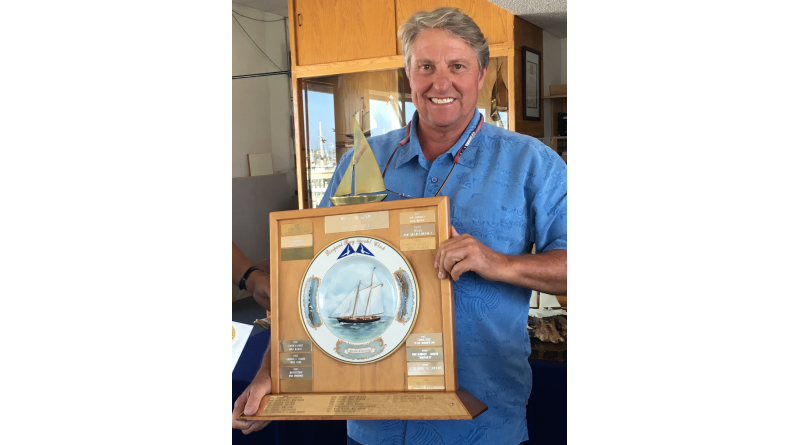 Larry Spencer on Blue Star took home the Milt Ingram Trophy for Pacific Corinthian YC. Additional perpetual trophy winners include: Woman Skipper: Out Patient, Stacey Peterson, Anacapa YC; First to Finish: Rock N Roll, Bernard Girod, Santa Barbara YC; Craig Ashby Memorial Trophy: Wahoo, Bill Gibbs, Pierpoint Bay YC; Mates’ Trophy: Eclipse, Katelyn Dembowski, Ventura YC; A Class Trophy: Rock N Roll, Bernard Girod, Santa Barbara YC; Tom Spurgin Memorial: Eclipse; Catamaran Class: Nacra Maniacs, Brian Wiless, Arizona YC. Copyright © 2019 The Log. All rights reserved.